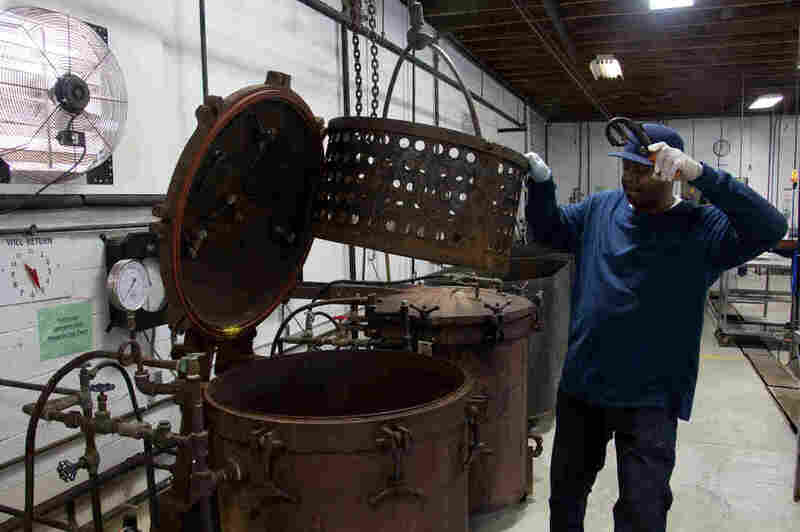 Virginia Farmers Revive Public Cannery : The Salt During the New Deal, the government set up hundreds of public canneries in small towns. Most have disappeared, but a surviving cannery in Farmville, Va., is getting a boost from local farmers. 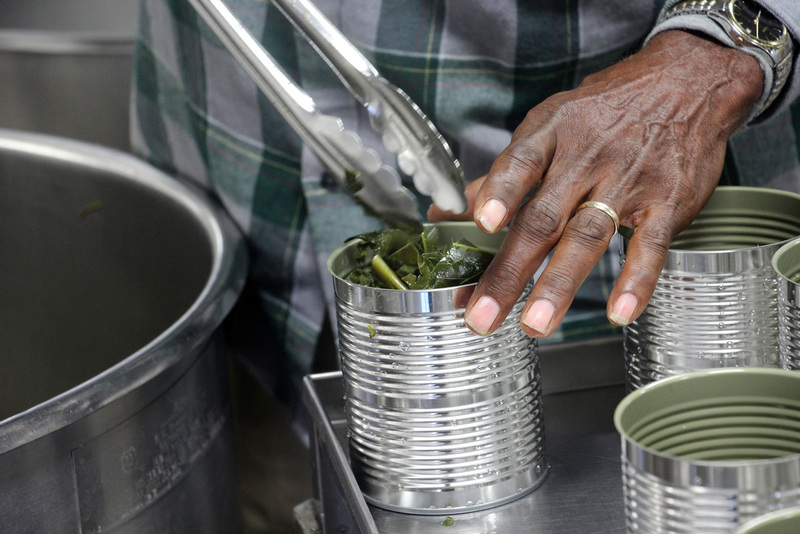 Roy Miller fills cans with cooked collard greens. The technology of canning, which brings those foods to us, was invented 200 years ago, and it was life-changing. With heat to kill disease-causing bacteria and a vacuum-sealed lid to prevent contamination, you could keep food edible for years. Allie Hill, left, director of Virginia Food Works, and Patty Gulick, manager of the Prince Edward Cannery. 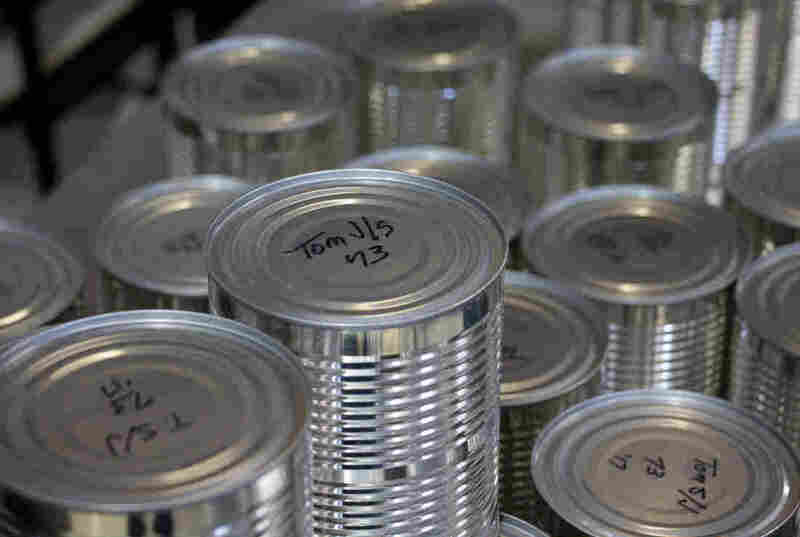 These days, cans are everywhere, but the act of canning has vanished inside the walls of huge factories. People don't do it as much at home anymore, and Allie Hill couldn't find many local farmers doing it in central Virginia. Then she discovered Prince Edward County's public cannery, a place where anybody can walk in with bags of produce from their garden and walk out with preserved food. Places like this once were common. "It used to be, every county in the commonwealth [of Virginia] would have a cannery," says Wade Bartlett, the administrator of Prince Edward County. Across the country, there were hundreds of them. Most were set up during the New Deal and the second World War. Many were part of the agricultural extension service charged with bringing technical know-how to rural America. They brought almost industrial-scale food preservation to small towns. Tom Crouse (left), Lester Goin, and Becky Goin peel sweet potatoes in the Prince Edward County cannery. Most of these public canneries have since disappeared, shut down when funding got tight. But Bartlett says that "the board of supervisors for Prince Edward County always thought it was an important part of the fabric of this county." From the outside, the cannery doesn't look like much. It's just a long, single-story brick structure in the outskirts of the town of Farmville. But Patty Gulick, who manages the place, says what happens inside is like magic. "If everybody could see what goes on in the cannery, the world wold be a much happier place," she says. People work side by side, help each other out, trade advice and recipes. "It doesn't matter if you're old, if you're young, your race, your wealth; everybody's the same in the cannery!" Rodney Scott, who works at the public cannery, loads a batch of cans into one of the two giant pressure cookers in the cannery. Half a dozen people are here today, both men and women, black and white. They're dropping sweet potatoes, collard greens, and tomato soup into huge cooking kettles that can hold up to 60 gallons. Cooked food then goes into steel cans of various sizes. Lids are attached by machines, and batches of cans then are lowered into giant pressure cookers. Cans of tomato sauce, after emerging from the pressure cooker. 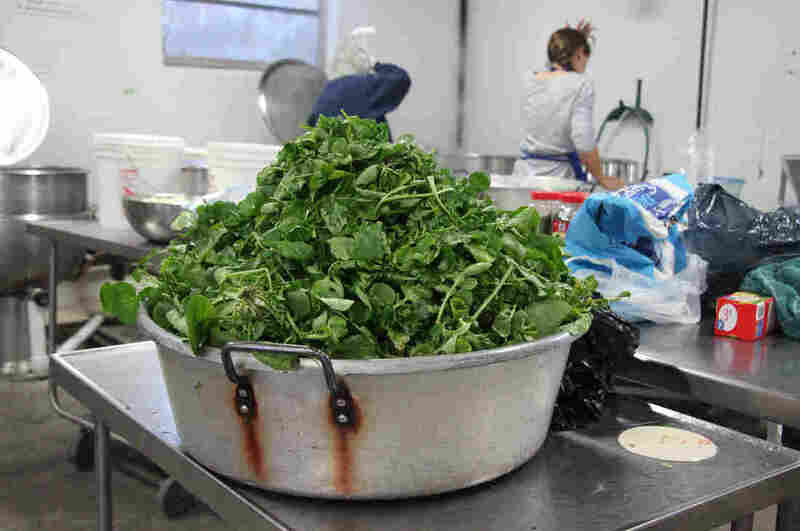 Rhonda Mayberry is canning what she calls creasy greens — similar to watercress. You won't find these greens in a supermarket, and they have a special place in Mayberry's heart because they helped get her through nursing school. "My husband and I lived in a little mobile home, and I was broke as a convict," she recalls. She spied these greens growing in a nearby corn field "and so I took his good hunting knife, and I found a patch of creasies, and sent them off to sell. And that was my gas money to get back and forth to my nursing courses!" Rhonda Mayberry's creasy greens, ready to be cooked and canned. For all the memories, though, the number of people who use this facility is modest, and the county has thought about closing it. But then Allie Hill, the local food enthusiast, discovered the cannery. She set up a non-profit group — Virginia Food Works — that now operates this cannery on days when the home gardeners aren't using it. And it's bringing in a whole different group of cannery users. This is the farmers' market crowd: Internet-savvy young farmers and small food companies that sell to people who'll pay extra for food grown nearby. "It almost seems to me that we are part of saving this facility. We are allowing this facility to be used in new ways," Hill says. Companies are using it to make apple sauce, ketchup, and barbecue sauces, packaging them in glass jars, with artsy labels. And in the process, they're reinventing an old tradition.